These pancakes are so easy to make. I never sift the flour, nor do I let the mixture stand like other recipes do, and they honestly taste just as good if not better..! From the time Ross gets home from school to the time the first pancake hits the pan it takes just over 3 minutes, I timed it (I'm pedantic like that!). I melt the butter, weigh the flour, break the eggs into the same bowl, add the milk-and-water mixture from the measuring jug and after whisking everything together I pour the mixture from the bowl on the scales back into the same jug I used to measure the milk (anything to save on washing up), pour in the melted butter, and voila I’m ready to go. Sift the flour and salt into a large mixing bowl. Then make a well in the centre of the flour and break in two eggs. Now start to whisk incorporating bits of flour from around the edges as you do so. Gradually add the milk-and-water mixture until all the flour is incorporated and the mixture is smooth and the consistency of thin cream. When ready to cook the pancakes, add the 2 tablespoon of melted butter to the pan and stir it into the pancake mixture. Then melt about a teaspoon of melted butter in the pan and swirl it around to coat the whole pan. Next turn the pan to a medium high heat, add about 3 tablespoons of batter to the pan and tip it from side to side to get the base evenly coated with batter. It should only take half a minute or so to cook, turn over and cook for a few more seconds on the other side. 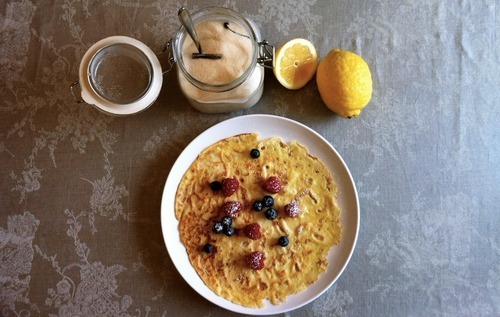 Enjoy with lemon and vanilla caster sugar, maple syrup and fruit, or nutella and banana.